This Masked Devil (Cyclochila australasiae), photo taken by Kipp Droby. A Cyclochia australiasiae with a “bitza” (little bit of everything) paint job — part Yellow Monday; part Masked Devil, by photographer Alan Davison. A Green Grocer with many shades to green, by a photographer named Howard. 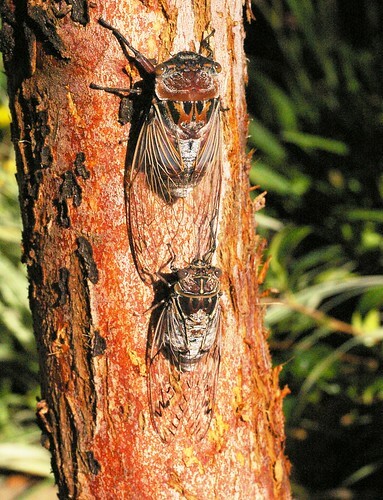 A nice blog post about Australian cicadas, by the Barnade Goose Paperworks. 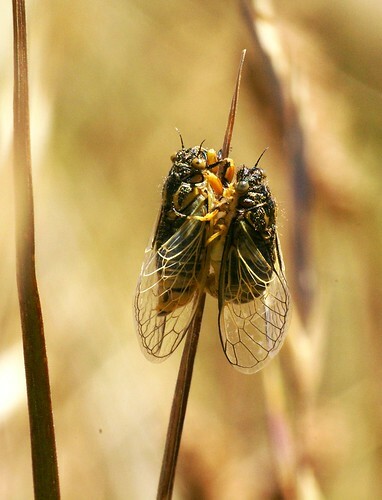 A chilling video of a moulting cicada being attacked by ants. A Redeye Cicada (Psaltoda moerens), photo taken by Michael Doe.